Seeking to inspire people to become mentors or mentees for both career and personal growth. Why are you looking for mentoring/what do you expect to get out of mentoring? And what do you expect to give? - As with anything in life it's key to set expectations at the beginning. We want to make sure that Mentor and Mentee/Protege have similar goals in mind. If there isn't agreement early on then you know this particular pairing is unlikely to succeed. Both individuals should move on. The reason to ask the second question about what the Mentee expects to give is to establish at the start that mentoring is a two way street. Typically people think of mentoring as being an older, wiser person "teaching" a younger novice. Mentoring is much more than that. It's an activity that ultimately benefits both parties when both are in it to give something to the other. Where do you see yourself in five years? - The number of years in this question (1 year? 3 years? 5 years?) isn't as important as finding out whether or not your new mentee has a vision or a plan for themselves. Some do have a plan and seek out your help to get them there and others don't which is why they are looking for mentoring. I like to know whether this person will need my help designing an exciting future for themselves or figuring out if the vision they currently hold is one that they really, really, really want. Have you had a mentor before and if so what worked/didn't work? - I ask, as any good Doctor would, if the person I'm speaking with has had any bad experiences (with mentoring) in the past. Mentoring is an activity that demands both parties be vulnerable at some point in order to achieve the maximum benefit. Too often allowing oneself to be vulnerable does not offer the results we'd like. As I'm big on learning from mistakes and want to ensure we avoid those moving forward I get these experiences out in the open early. If the person is new to mentoring all together I take extra time setting the ground rules and expectations as discussed in my earlier post. What propels you?/What is holding you back? - It's important to find out if your new Mentee/Protege is self-aware or not. When I have someone who can't easily answer this question I take the time to get them to be a bit more introspective. If someone provides me with clear, self-reflective answers then we're ahead of the game. Are you happy? - This is the grand daddy of them all! The 'ultimate' question. The mother of all questions. Most individuals initially seek out mentors because they are unhappy with something about themselves or their career. This question is key and the answers I get at the beginning are ones that I keep checking back into over the course of a relationship. Sometimes I simply help the Mentee achieve what they've decided will make them happy. Other times I guide the Mentee in changing (read: re-framing) their definition of what makes them happy. The latter is almost always a more powerful, awe-inspiring experience because many of us don't recognize the core of what makes us happy. We rarely realize the number of paths that core allows us to take that would make us truly content. Watching someone come to new realizations is one of the things I enjoy most about mentoring. Of course there are thousands of things to ask and talk about over the course of a mentoring relationship but the above 5 should be good to get you started on a productive, mutually beneficial journey. Feel free to post some of your favorite questions to ask a new mentee in the comments below! 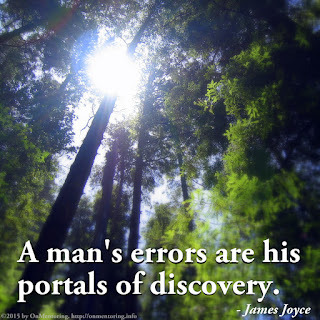 "A man's errors are his portals of discovery" - James Joyce. I could have created this posting out of nothing but great quotations about mistakes and experience. Don’t just gloss over those two quotes above. Go back, read those again and spend some time internalizing them. Go ahead and really do that! I promise to wait for you. This posting grew out of a mentoring conversation I was having with a soon-to-be new manager but it really applies to everyone. This mentee was appropriately conscious of how damaging a bad boss can be to a team's morale and success. He was apprehensive about making mistakes in his new role given the impact it could have. I told him that it's not all about avoiding missteps - it's also about learning from those errors. The key to success is neither to dwell on your mistakes nor easily brush them aside. The key is to be sufficiently reflective and then proactive. This idea around the benefits of making mistakes is not a new concept by any stretch. But if you are a Type A personality like me a gentle reminder every once in a while of the gifts that mistakes hold for you is necessary and welcome. To excel, to be vibrant, to be a leader you can’t always play it safe. Most of us are not comfortable with making mistakes. We worry about the impact to our work or friends or family. We worry that we will look foolish. All those things may still yet happen. What one can count on though is that at the very least every mistake is a learning opportunity. I like to remind mentees that as painful or embarrassing as a blunder they made may feel this very blunder is likely saving them from even worse ones later on. As the leader of organizations myself I want to be clear that I'm not thrilled when someone on the team makes a mistake but I'm not someone that thinks it's the end of the world either. I believe mistakes are a kind of investment an enlightened company (or leader) makes in an employee. Mind you this is not meant to encourage brain surgeons or policemen or firemen to make mistakes. I’m talking about the mistakes that occur outside the realm of saving or protecting lives. (This posting may apply to those areas as well but I do not feel at all qualified to discuss these issues from that perspective). 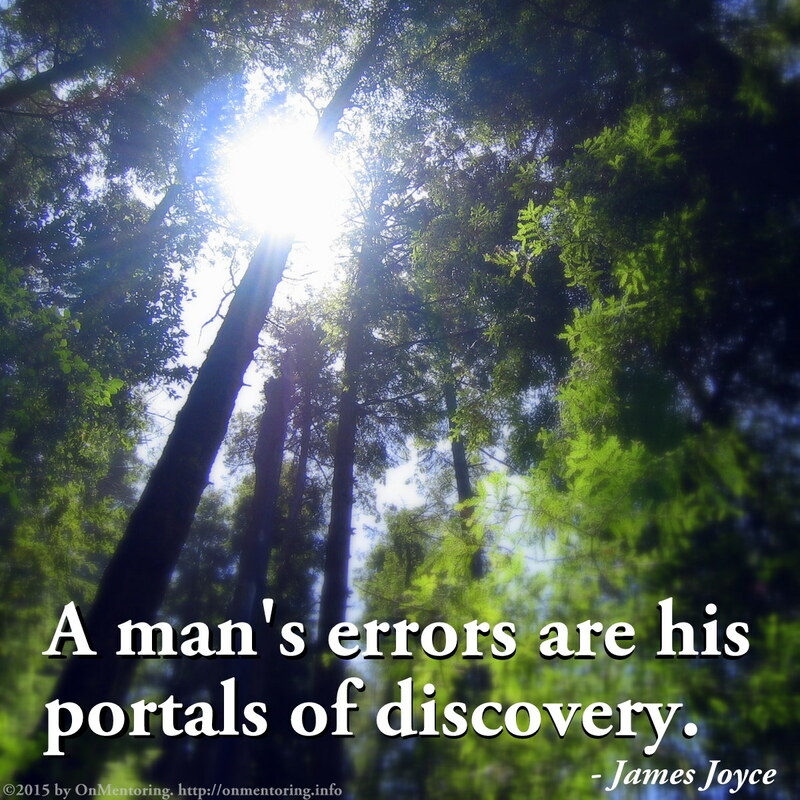 If a mistake is repeated it is no longer an investment - it becomes an investigation. Something or someone is off so it's time to go to the next level of problem solving. If you haven't had this perspective on mistakes I hope you'll take these ideas into consideration. If you already share this perspective hopefully this serves as a welcome reminder that I too find useful! Please note: you will receive an email to verify your subscription. You must complete this step to start receiving your subscription. Check your spam folder if you do not receive it. We do not sell email addresses ever. Period. VIDEO: Subscribe to the OnMentoring YouTube Channel! "The best way to escape from a problem is to solve it." All content ©2010-2017 by Alan Saporta. Simple theme. Powered by Blogger.